One of my mother's favorite sayings is "Kill me, but make me beautiful". It's a cultural saying, but in an age of waxing, threading, and other painful beauty trends, it has never been more relevant. That's how I feel about knitting ruffles. I love how they look. I love wearing them. I love adding a little extra bounce to my step to make them swing when I walk. I also find them utterly painful to knit. Not literally, of course. It's not like faggoting, which is the natural enemy of my carpal tunnels. It's just... a lot of knitting. 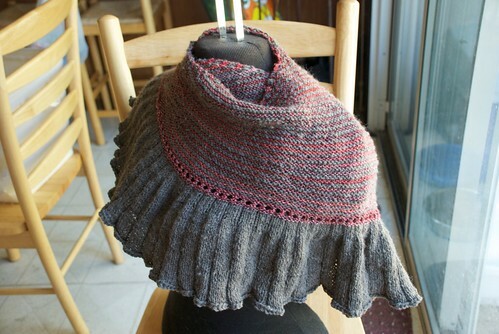 Which is a silly, because I'm usually itching to knit something else. Which is technically, THE SAME KNITTING. But then you look at the ruffle-in-progress, how far you have to go, and if you're me, you feel like Brent Spiner in Independence Day. You might also have done a dramatic re-enactment for your family, shaking the shawl in front of you and rasping out, "Kiiiiiiiiiiiiill meeeeeeeeeee" in the creepiest voice you can muster. So creepy that both dogs decide it's time to leave the room. So you knit and knit and knit. Then you knit some more. You decide that you will NEVER knit another ruffle EVER again so long as you LIVE. You knit a baby hat and a baby sweater in the meantime, because sometimes you just need a relationship break from a project, you know? It's me, not you, Sothia. But since it was LOVE with Sothia, once you finished your dalliance with a baby hat and sweater, you come back, refreshed and ready to commit. And you will commit, wholeheartedly. After what seems like an eternity, you begin the bind-off. You stay up really, really late because all you want in the world is the satisfaction of finishing this project. And also, Kit Kats. I can feel your ruffle envy. You double your yarn for the bind-off, because you LOVE how substantial it feels, and then spend the remaining 60% of the bind-off wondering if you have enough yarn to finish. You then decide if you run out of yarn, you're abandoning this project forever. Thankfully, you have enough (and a little leftover, even!) and that particular set of events doesn't transpire. 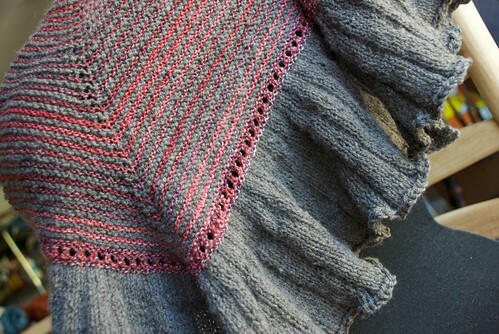 You go to bed, and the next day, you realize that you have a GORGEOUS shawl. 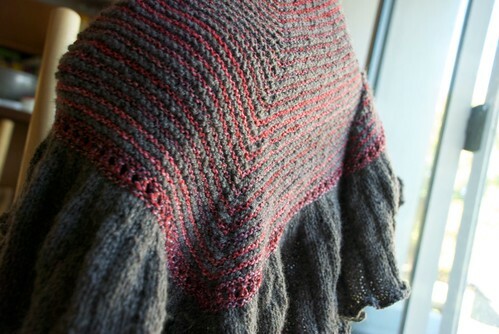 You consider turning up the air conditioning so you can wear it around the house, but instead decide to weave in ends and take pictures of your beauteous shawl. In my mind, this wrap will make me six feet tall. It's the "V". You look at the colors, the beautiful ruffle, you feel that rush of accomplishment and pride at a job well done, and you say to yourself, "This wasn't so bad. It was really fun to knit." "...Maybe I'll knit another one." Finish my ruffle for me, please! Hilarious! And yes....I always think I want to knit another. It's so pretty! I love the doubled cast-off, too. Now I have to go rooting about in my stash for appropriate yarns! Whee! The ruffle reminds me of slogging through endless miles of stockinette for an oversized Citron. I love the feel of wearing it so much I've started a second one from superwash to leave at work. I'm about 120g of sock yarn in; the first took around 460g total. And why did I convice myself this was a good idea again? I feel like that with the bands on the Breezy Cardi of K2P2 for 3". I am short, so cutting it to 2"! You are tempting me to knit one. I am tempting you to continue writing and turn it into a book. Beautiful! So was this the pattern your mom was working on tonight? Just like a mom to take on the second one...! Love! Love! LOVE! That shawl. Truly amazing. Worth the pain, agony and delusion. ;) Might just try and knit one myself. Ruffles are like child birth. You agonize through them and swear you're "NEVER DOING THIS AGAIN!" After it's all said and done, you look at your beautiful finished project and think "I could TOTALLY do that again!"